I look back at recent meeting with John Sinkevics of LocalSpins.com. On February 27, 2017, we got together to learn about “Local Spins” and how artists can improve their marketing and promotion in a way that provides publications with the information they really need. Our speaker for the night was John Sinkevics, publisher of LocalSpins.com, a website covering musical happenings around West Michigan as well as concert listings, guest columns from artists, videos, podcasts and reviews. Also, On Wednesdays “Local Spins Live” brings music and interviews to News Talk 1340 AM as well as on Fridays where you can find “Local Spins on WYCE” live on 88.1 FM WYCE. Beyond the internet and radio, Local Spins works with River City Studios to record sessions called “Live at River City” and John also hosts a concert series at Speak EZ Lounge on Wednesday nights. John started our meeting with information about how he got to where he is today. 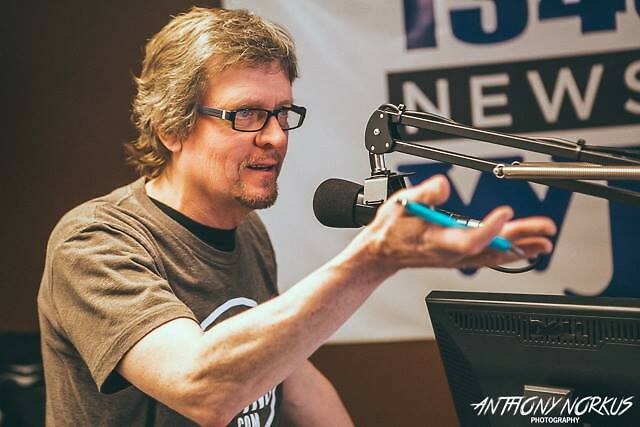 With over 30 years with the Grand Rapids Press he was actually the first to pitch the idea of album reviews at the paper. He noted that as a journalist he covered everything from politics to development news but always had a passion for music. This spring will mark the 5-year anniversary of John taking a chance and starting Local Spins. The main focus on the night came from a neatly printed handout that John supplied to the crowd. The contents included tips on press releases and how to approach media when artists are looking to receive exposure. He suggested that musicians should keep all online content such as websites updated and easy to access. John suggested that making it easy to find a description, high-resolution photograph and a band’s music is key. Making sure all event dates are posted with as much information as possible also helps media streamline the process of promotion. “Not every band is worth writing about, yet” was something he said that I found to be very interesting. As a group this sparked a conversation about making sure as artists we are doing all that we can to attract the attention of media such as Local Spins. John suggested spending an hour a week just working on making sure information is correct and consistent. It makes sense. Musicians spend so much time working on their craft that sometimes they forget that promotion is a very large part of trying to advance a music career. It’s important to update content and create new material that is fresh. New videos or photographs help keep an image active and current. Also, by creating a separate page on your website dedicated to promotion with those elements mentioned earlier, a band can point venues or media to that location to get information about the artist. Overall the night was a success. Many people asked great questions about what John thinks media folks look for in correspondence and content. We learned that lead time is a very important element as is making sure your request is relevant to the publication you are reaching out to. John will be heading to Austin’s SXSW this spring to take part in a panel called “Lessons Learned from Austin” in hopes of bringing home some of the good that comes from a large music festival and conference such as SXSW and applying it in Grand Rapids. For Let’s Talk GR Music, our next event will feature Glave Business Solutions and we will be talking about taxes and legal strategies for artists. Let’s Talk GR Music always meets on the last Monday of the month. Our 16th meeting will take place Monday, March 27, 2017, at The Wealthy Theatre Annex located at 1110 Wealthy St. SE. For more information you can find it here at The Rapidian, by searching “Let’s Talk GR Music” on Facebook or by following the Twitter handle @LetsTalkGRMusic.